It's all about the photos: 'Autumn walk.' By cheska annelliese. Autumn walk., a photo by cheska annelliese. on Flickr. Autumn is well and truly here. There's no fighting it any longer. It's getting rather cold - especially first thing in the morning - and the rain has come. I am typing this whilst listening to the rain lashing against the window outside. I still trying to embrace the change of season though and so far all is good. My daughter is settled in at primary school and I am actually loving the new routine of a school run every day. I am back at school too as I have started an evening course at college which I am very excited about. I am taking my little boy out to lots of new groups and classes and we are having lots of fun together. I do miss my daughter when she's at school but I am cherishing all this one-on-one time I am having with my youngest child. I also have recently bought lots of new clothes for autumn. Nothing exciting but it does feel nice to have some fresh new clothes to start a fresh new season. And it really does seem like a fresh start, September always has done. It obviously dates back to being at school but I've never really shaken off the 'school year' timetable. And now I have children well it starts again. I will be thinking in school year now probably for the next seventeen or so years! I love this autumn picture. The light is wonderful. It looks like a lovely sunny day. The kind of day I love in autumn. This also reminds me to dig out my (pretendy) Uggs. 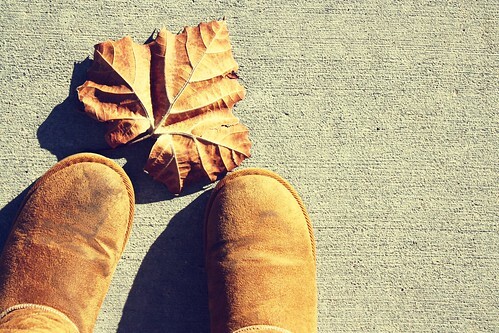 I didn't wear them at all last winter but I get this feeling this winter will be a snuggly Ugg boot kind of a winter.